We have a few options for adjustable control arms for Z cars. We can purchase parts from any number of vendors or we can make the parts adjustable at home with a welder, some patience, and some skill. This thread will look at the differences between different designs and compare and contrast features. 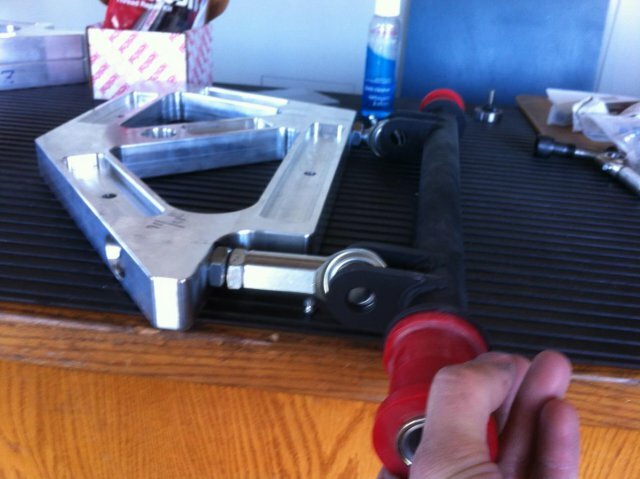 It will also compare the adjustable arm to other adjustable parts like camber plates and bushings. Let's start with a little safety info about what is probably the most controversial part of the various designs available... the rod end. Most of these parts use rod ends to adjust the length of the arm. Rod ends are spherical bearings with a threaded end (male or female). Rod ends should never be set so that the amount of thread engaged is less than 1.5x the diameter of the end itself. So a 5/8" rod end would need 15/16" threads engaged in order to be considered properly installed. A typical 5/8" rod end has 1 5/8" of threaded shank, so that means that you have 11/16 available thread to adjust with. Subtract the thickness of the jam nut which is 3/8", and that leaves you with not a whole lot of adjustment--5/16" to be exact. I'm not an engineer, but I'll do my best to describe this issue. A stress riser is a sharp edge, and a sharp edge on any stressed part can lead to a crack. The threads in the rod ends used in most of the control arm designs are stress risers. The worst thing you can do to a stress riser is put it under a bending load. Particularly in the rear of the Z, this is exactly what we are doing. The farther the rod end is extended, the wose the bending load is. The bending load tries to spread open the threads and "continue" the crack. If the crack does propogate, this is going to result in a snapped rod end, which results in sudden and violent toe change which most likely will end with the other rod end letting go, and from there an accident. You need to decide whether that risk is acceptable and what kind of maintenance and inspection schedule is appropriate for these parts. NVH--Since rod ends have no insulating property, the vibrations in the control arms will be transferred to the chassis. This makes the cabin more noisy, but there is a more serious factor at work. The lack of a bushing means that sudden impacts to the suspension will also be transferred to the chassis and these can lead to weakening of the structure of the car, weakening of the control arm, or both. On the car adjustable simply means that you do not have to disconnect parts of the suspension in order to adjust the length of the arm. This feature is a selling point of many of the available control arms, and is particularly important in the rear control arms. Camber bushings are available for our Z cars as an alternative to adjustable control arms, and these have limitations that are often overlooked. When one adjusts the camber the toe changes as well. The bumpsteer also changes. The bushings don't adjust camber very much (about 1 degree total adjustment) and they necessarily bind the front suspension. As the front control arm moves up and down, the TC rod pivots with it. The TC rod pivots on an arc, and this arc wants to make the control arm forward until the TC rod is parallel to the ground, then back until the suspension bottoms. The camber bushings don't allow for this swing since they are made from very hard Delin and aluminum, so this stress is taken up jointly by the TC bushings and the crossmember. Stock rubber bushings will flex to allow this sweep, although commonly used polyurethane is also fairly stiff and increases the stress on these parts. A rod end on an adjustable control arm allows for this movement with no increased stress at the crossmember or the TC rod. The suspension is free to travel its natural arc without any binding or increased friction. Adjustable front control arms can be used to adjust the front track or to adjust front camber. Whenever an adjustment is made to the front control arms it will change the toe setting, so toe will always need to be adjusted after adjusting a front control arm's length. This situation makes adjustable front control arms less desireable for at-the-track camber changes, even when the arms are on the car adjustable. What is more desirable from a quick adjustment perspective is a camber plate. Camber plates, especially the slotted type, can be adjusted for street driving and then changed at an autox or a track day and again changed back in a matter of minutes for the drive home. Changing camber at the plate does not affect the toe setting, making it a much more convenient way to go. What adjustable front control arms can do is change the track width or possibly even square up a car that has been in a wreck. They can also make small camber changes with the rod ends, but the custom arms can be made longer to add larger amounts of negative camber if desired. For the purpose of changing track or squaring up a car, or adding longer arms to make large camber adjustments, adjustable arms which are not on the car adjustable can be used to good effect. They can be adjusted by removing the inner control arm pivot and unscrewing the rod end or by disconnecting the sway bar and ball joint and unscrewing the outboard end of the control arm. Here is a sequence of pictures of bjhines's custom fabricated rear control arms (not on the car adjustable). This is just one way to do this job. Another is to weld a tube into the control arm and then weld a threaded tube end that fits a male rod end into the end of the tube. The Z rear control arms are not adjustable and there is no stock provision for toe or camber adjustment. The most common and easy method for adjusting camber and toe in the back of a Z is by using offset bushings like those available through G Machine. These are a cheap and easy alternative to changing control arms and work reasonably well in the rear. If you need more adjustment or are interested in the idea of adjustable arms for reducing friction or deflection, then adjustable rear arms may be a solution for you. On the car adjustment takes on a whole new importance on the rear control arm. The difference between the front rod end and rear rod end is going to determine the toe setting for the rear tire. This difference gets multiplied as the changes are made ~6" away from each other at the rod end but they affect a wheel that might be 25" in diameter. So a small difference at the rod end makes a much larger difference at the tire. With this being the case, on the car toe adjustment becomes much more important. The arms that do not have on the car adjustment require that the spindle pin be pulled to adjust the toe, then the rod end turned out or in by 1/2 turn increments, then the spindle pin be reinserted and the jam nuts locked down. This results in a very coarse adjustment for toe, and it is probable that the resulting toe setting would not be identical on both sides. On the car adjustment in this case means that the rod ends don't have to be turned in order to adjust the toe, which means that the toe can be changed to an infinite number of settings and can be dialed in to the exact setting preferred. Again, adjusting the camber with the control arm in the rear is not a very convenient way to go. If one is using the on the car adjustable arms, the adjusters have to be turned out exactly the same amount front and rear in order to prevent a toe change. If one is not using an on the car adjustable arm, then the rod ends can be turned out x number of turns front and back, but in order to make an adjustment the spindle pin has to be removed to make the adjustment. In addition, some rear control arms have either the front or rear rod end on the car adjustable for toe, but not the other one. In that case the spindle pin would need to be pulled to make and adjustment AND the toe would need to be reset afterwards. Camber plates are a much better way of adjusting camber than adjustable rear control arms. Even the offset bushings, which can be a pain to adjust, are much easier to deal with. Whether you buy it or make it there are several reasons for using adjustable control arms. Camber change is possible with these arms, but not easy, and is limited by the length of the tie rods in the front and the amount of thread engagement of the rod ends in the front and the rear. Toe adjustment is irrelevant in the front and requires a well designed adjuster with on the car adjustability in the rear. Track width adjustment is possible with both front or rear adjustable arms, but is again limited by the rod end thread engagement. Track can be changed for either squaring a bent chassis or just adjusting to make the car handle better (wider track = better grip on that end of the car). Reduction of friction is a key to good handling, and using rod ends or monoballs will dramatically reduce friction when compared to polyurethane bushings. Reduction of deflection keeps the alignment settings more consistent, and also keeps the suspension from binding. All of these factors allow the suspension to be more compliant, allowing the suspension to keep the tire on the road even with stiffer spring rates and shock valving. Adjustable control arms are not necessary for your street Z car. Most of them are also not all that adjustable when it really comes down to it. But there are some good reasons for using them and various different ways of implementing the common design ideas. Every modification of the suspension is going to require a fairly deep knowledge of the potential problems associated with it, and there are some pretty serious pitfalls that can catch you offguard if you're not aware. Do as much research as possible on the design strengths and weaknesses of any parts you might purchase. Don't weld your own suspension parts if you're not experienced and don't trust your fabrication skills. Similarly there are more and more small companies and ebay sellers offering these parts out there and none of them are very big. The level of engineering and failure testing of any of these parts is usually (always???) completely unknown. We have had people design a part and make a prototype, post pictures of it here, get feedback and use the feedback on the forum to redesign the part. Sounds good so far... but then, presumably with no failure analysis testing, it was put up for sale on ebay. Is the part "safe"? It's impossible to say. It truly is a "caviat emptor" world out there. Any of the above modifications are done at your own risk. Nice thread/ information Jon. Do you have any updates, finished pics to add? If you're looking for finished pics of my control arms, no. After a discussion about how to improve them here: http://forums.hybridz.org/showthread.php?t=129154 I trashed the ones in this thread and started over. The original design I had was just fine, but I think the new design will eliminate some side loading of the strut and is really a big improvement over pretty much anything out there right now. I also continue to believe that Dan and I struck upon a really good idea by moving the "load bearing" rod end to the rear and using the short turnbuckle in front and that this will is the best solution I've seen in terms of loading the strut vertically and eliminating side loads. OE Automotive components (for safety factor). To bring the roll center and bump camber gain on a lowered car closer to stock. To reduce OE bump steer (and not vary lower control control arm length which could induce bump steer). 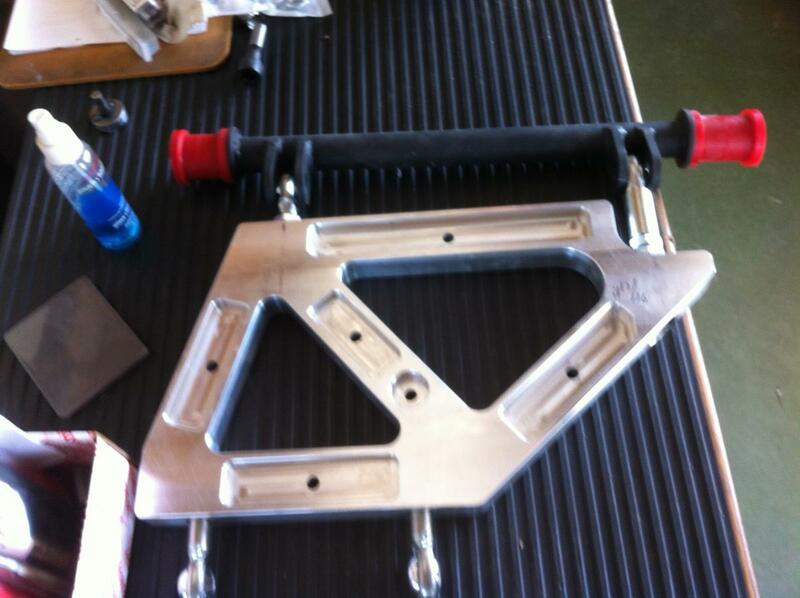 The chosen path was to make the inner control arm pivot (on the front lower crossmember) adjustable using cam bolts. Using camber bolts gives greater range of adjustment than is possible with eccentric control arm bushings. Because I was also raising the control arm pivots 3/4", I had to remove the control arm pivot reinforcing washers in the cross member. If not raising the pivot, you can slot the existing holes. The below photo of the cross member shows the spot welds on the upper washer (in the picture) drilled out and the washer removed. The lower washer is still present and the three spot welds are visible. The original inner control arm pivot and spot weld holes were welded up and new holes drilled 3/4" higher. The holes were then slotted about 3/4". Every 0.2" of slot provides about 1/2 degree of camber adjustment. Plan your side to side hole location and slot length based on whether you need to reduce or increase camber. Note that as you reduce camber, the control arm pivot will come closer to hitting the inside of the cross member. You can grind some of the material off the top end of the control arm (as detailed in the JTR manual (http://www.jagsthatrun.com/Pages/Datsun_Z_V-8.html), plus gain clearance by raising the pivot less (or not at all). Mock up what you want to do to check for adequate clearance before drilling & grinding. The below image is a roughing out of the slot (I ended up having to bring it to a machine shop to have it welded up a bit to true the sides, then final machined -- fair warning...). The cams on these bolts are large enough that they actually ride on the lower / outer flange of the control arm. In the below image, as you rotate the bolt clockwise, the cam push against the flange and moves the bolt inboard in the slot, reducing camber. 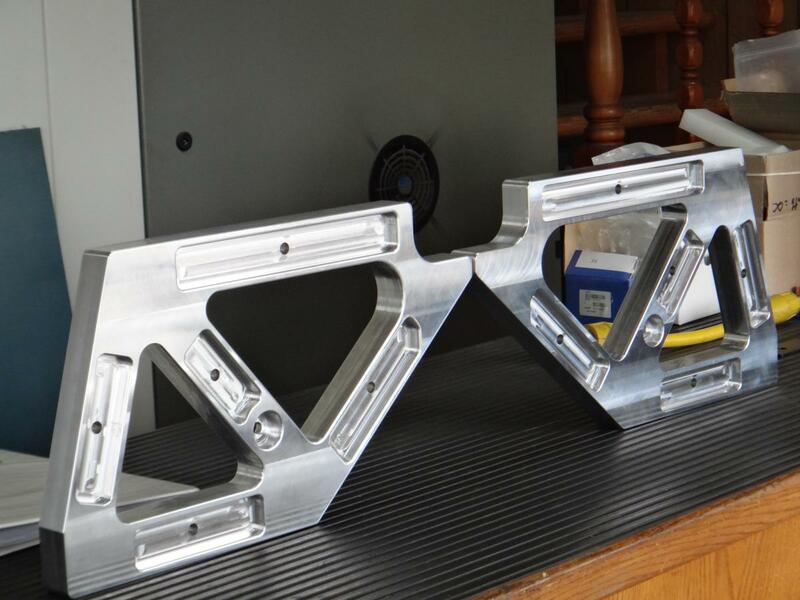 Note that the machine shop also does sandblasting and powder coating! You still need something for the cam to push against as you turn the bolt to increase camber. I had the shop weld a small piece of metal onto the face of the cross member for the cam to push against. The location for this can be determined by inserting the cam bolt into the slot, and rotating it back and forth while holding a rod or pencil along the inside of the cam. For my purposes, the metal rod needed to be welded to the cross member near the inside top of the cam. If you are doing this mod without access to a welder, you may be able to drill and tap hole and thread in a short bolt for the cam to push against (make sure the bolt does not interfere with the control arm). In the below picture, the black section of rod is visible near the upper left of the cam. Depending on whether you removed the cross member pivot supporting washers (and how bad you buggered them up in the process), you will need to re-use them or buy new washers the same thickness for reassembly. The OE lower control arm bushing sleeve is not very thick, so if you get new ones, it is better to get ones with a slightly smaller hole and drill them so the just fit over the cam bolts, rather than to buy ones that have too large a hole. Note that as with any adjustable control arm or pivot, small camber adjustments result in a large change to the toe (you must do an alignment whenever you adjust camber). looks very similar to what is done to allow camber adjustment on the z31 semi-trailing arm suspension. I am sure going to follow this fellow. Don't you have two pivot lines at the inner mounts? At the bushings and at the spherical bearings at the adjustable rod ends. How will that work? It also looks like some of those heims were mounted in an uncaptured single shear setup. You really need to put some of these retaining washers on them. Thanks for this advice ! Are these retaining washers going each side of the rod end ball ? Only on the side that isn't captured by a bracket. I saw a picture on a forum a long time ago and basically what happened to the guy was the body of the heim went over the head of the bolt when the bearing got ripped out. This was on a smaller and lighter car than a Z too. For the couple bucks its probably not worth taking the chance. Also put seals-it boots on them, it will help keep the grit out of them that tears them up. They are VERY hard to put on but so tight I dont think water can get in there. I just noticed they make elastomer rod ends now. It doesn't say the strength rating of them but they would probably help with the NVH downside of heims. Cool i'll bought those for sure ! I'll update my pics just for information. Jay23, I agree with NewZed's comment above. You have two inner pivot axes, one on the poly bushings and the other on your heim ends. I think that's going to cause all kinds of weird handling issues. Yeah, I'm forseeing rear track changes mid corner. Also, that control arm is going to bind against the inner bar, once it twists around. That is not a good control arm design. "Not good" is an understatement. Arizona Z Car does the same thing. I think they now suggest people use a set screw, but that design has never sat well with me. Put your parts in and then weld a tube across the front and back to hold the other tubes in place. At least that way you won't be twisting at both pivots. This sound right, keep in mind that this is a prototype, I didn't think at this first, i designed my inner bar with my old bushing without thinking about rotation of them, but the mod is not that complicated i guess, i just need to replace my rubber bushing by steel sleeve witch i could weld it on like JMotensen said if I understand. But my control arm isnt bad as such. I think it would be strong enough and then, I would only have pivot by the heim ends, thats sound logic isn't ?. Also keep in mind that the heim joints alter the pivot point of the rear LCA, so your roll center will be higher and the camber curve will change.